These large dragonflies usually zoom back and forth across the pasture in continuous motion. The other day, one stopped for a minute and perched on a T-post long enough for me to get a few pictures. Dragonfly on T-post. Who knew barbed wire could make such a pretty background? 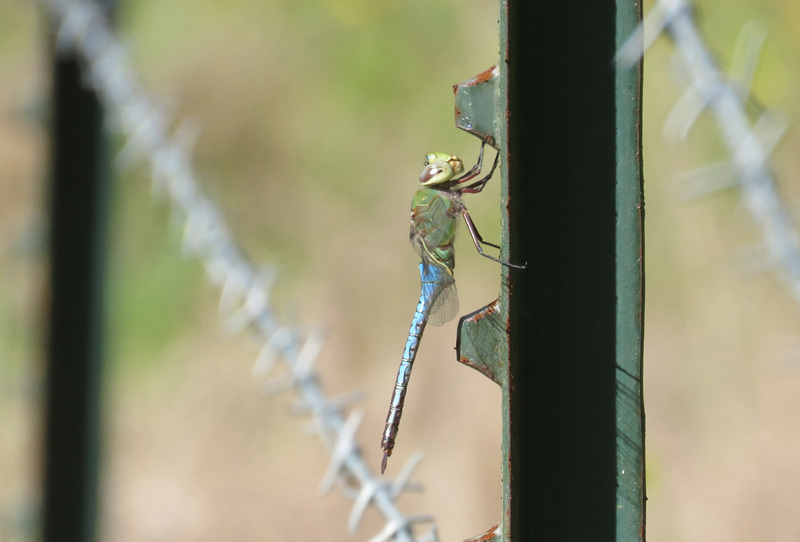 Common Green Darner, I think. This is the 18th species of dragonfly I have identified on our farm. Those are magnificent photos–nice of him to pose so well! I’m impressed that you’ve identified 18 species of dragonflies on your farm. I couldn’t do it without Dragonflies of Texas by John C Abbott – it is a Texas Natural History Guide from UT Press, and it is structured so beautifully, it makes ID much easier.